Various physical and behavioral adaptations allow animals to thrive in the tundra, the zone around the Arctic Circle beneath the permanent ice pack that surrounds the North Pole. In this part of the world, winter rules much of the year, and temperatures plunge as low as 76 degrees below zero Fahrenheit. While some animal species either migrate or hibernate to cope with the brutal Arctic winter, others tough it out and stay active year round. Many animals, including millions of birds, migrate south and avoid the frigid winter temperatures altogether. Migratory ducks and geese return to the Arctic tundra each year during the brief summer months to breed and raise their hatchlings. Arctic terns fly from one pole to the other to take advantage of the brief periods of polar summer when the sun never sets. Some mammals such as caribou migrate as well, spending the summer months grazing in the tundra before cooling fall temperatures send large herds south for the winter. Frigid temperatures aren't the only challenge to winter survival in the tundra, when plants go dormant and food is scarce. Unlike plants and insects, mammals cannot go into a complete state of dormancy, but many species retire to dens or burrows and sleep through the winter. Mammals like Arctic ground squirrels and grizzly bears hibernate, slowing their breathing and heart rate. The animals' slow metabolic rates allow them to live off of the fat their bodies store from the food eaten in the summer. 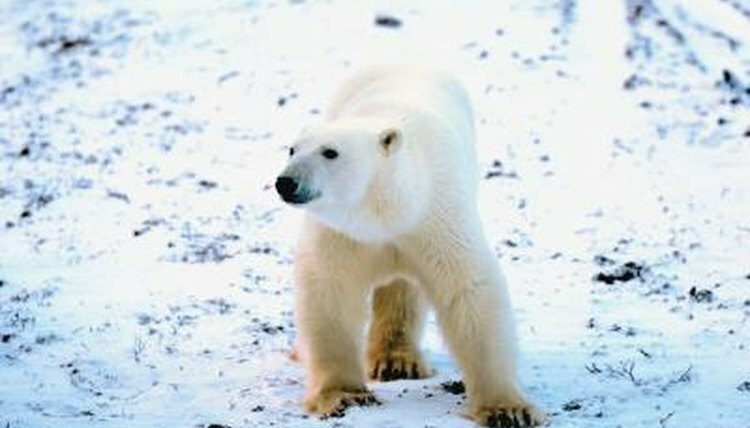 Some animals neither hibernate nor migrate but remain active throughout the year. These animals have physical adaptations to keep them warm despite the frigid Arctic winters. Layers of blubber insulate and help marine mammals like seals and walruses conserve their body heat. Musk oxen have two layers of protective fur to keep them warm during winter on the tundra. Some birds, such as the ptarmigan and the snowy owl, also remain year-round, sporting double layers of feathers to protect their bodies. The ptarmigan even grows feathers on its feet and dives into snow drifts seeking further insulation and protection from the Arctic winds. Average temperatures in the Arctic are warming rapidly, increasing by 5 degrees Fahrenheit in the 30 years between 1973 and 2003. The tundra habitat of both migratory and resident animals changes irreversibly with thawing permafrost and longer growing seasons. Warmer springs cause hibernating animals to wake earlier. This also causes migrating birds to return to the region and nest on earlier dates, although they maintain their usual mating schedules. For example, in 2002 when the snow melted 18 days earlier than usual, snow buntings returned to roost and raised two broods in the same year as opposed to their usual one.